Mt. Baldy - Angeles National Forest - Beyond Limits on Foot! To get to the trailhead off of 210 freeway take the exit Mountain Avenue and make sure you are heading North into the Angeles National Forest. When you hit the intersection with Shinn Road veer left and continue to Mt. Baldy Road. Follow Mt. Baldy Road, veer right onto Mt. Baldy Road and after a few miles you will hit a small parking lot just past Manker Flats campground. Find a parking spot and get ready for your trek as you will take the road to San Antonio Falls. First, driving up the portion right as you pass the Visitor Center has hairpin turns, be cautious going around corners, they creep up on you. Do not pass the Visitor Center without buying an Adventure Pass – $5.00 one-time fee or $30.00 for the year starting from date of purchase (our mistake not to ask that question). Manker Flats sits at 6,160 feet. We began by going up a Falls Road on the left side of the road to San Antonio Falls about 0.6 miles in. A couple people passed us running down the hill, not exactly sure how long they were running, but they were definitely running. San Antonio Falls is a quiet 3 tier waterfall and we witnessed rock climbers going up it’s face. I’m guessing when there is a lot more water/snow this cannot be accessed and done. After a quick pit stop at the Falls we proceeded on about 0.3 miles to an easily missed fork – and I say that because we easily “almost” missed it. The choices were to go to Ski Lodge or go straight up to Mt. Baldy via the Ski Hut route. We took the left fork and headed straight up to Baldy (Ski Hut Trail). There was absolutely no other way than up during this portion of the hike up to Mount San Antonio (known as “Baldy” to most). After some ascent of straight uphill and heavy breathing we could see a glimpse of the green ski hut. This was going to be our break spot, but it just seemed so far away. We made it up without stopping and by this time we were 2.6 miles into the trail at 8,150 feet up. The Ski Hut was built in 1931 and can still be rented out to those who dare (I would). Took a quick 5 minute stop and we headed to the hardest part of the climb, 3 long stretches of 70-80% upgrade. This area is called the Baldy Bowl, the south face of the Baldy. After about 1 mile from the ski hut is where we began to feel the elevation. Long breaths, water and snack got us to the top. We must of hit at least 40 switchbacks from Manker. We finally arrived to the summit and it was packed, but since the drizzle was picking up a little bit and it was fairly windy, many visitors decided to start down the hill. This gave us a little comfort of silence, but not enough as we looked out around us with a 360 degree view of everything below us. 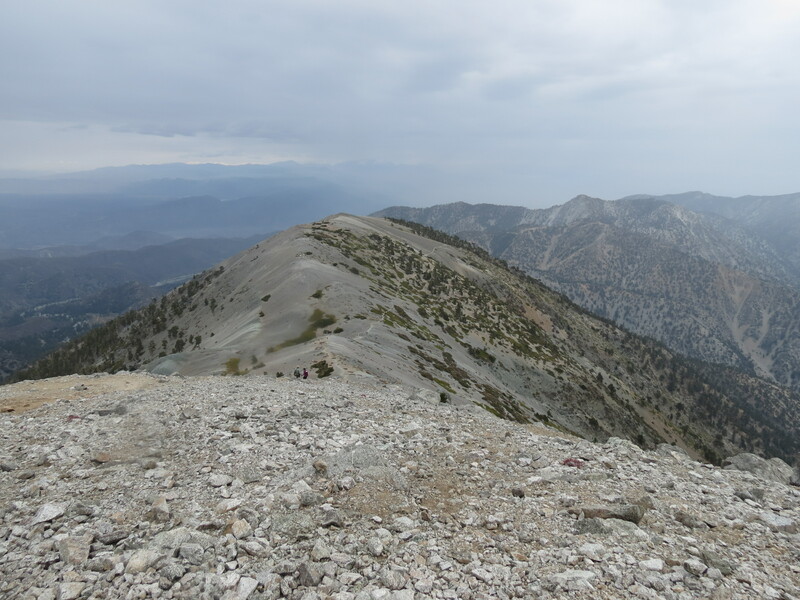 Mount San Antonio’s (Baldy’s) summit is 10,046. In just about 2 hours we did 5.1 miles and almost 4,000 feet up. This would mean we paced just under a 1,000 foot gain up every 30 minutes. CHECK! Mt. Baldy is the 3rd highest summit in Southern California. Why I have not done this hike before I do not know. After a break, since it was drizzling and cold we started running/walking fast down to the ski lodge. This definitely took longer than we thought, mostly because we were going down Devil’s Backbone Trail, which was slippery because of the eroded rocks and zigzags to follow. From the Summit to the Ski Lodge we finally hit about 8.75 miles. This is a very popular place to enjoy a beer or lunch after their long hike or just because. We took a break as well enjoying both, but brought our own lunches. We noticed many of the hikers we passed by or were next to decided to take the ski lift down. We did not allow ourselves to have the same luxury. Though to me it isn’t a luxury, it’s more of a way out (unless you were planning on it). It costs $10.00 for a 13 minute ride. Which means you are paying almost $1.00 a minute, which means if you were a ski lift you and you let 30 people take you within the hour you would make $300. I’m in the wrong business! Last part of the hike down was a little more dull because we took the fire road down, but we were the only ones on the road, which let us be and feel the silence around. We then hit the parking lot of the ski lift and took the zig zag paved road down to the car. I would recommend this hike to anyone who would like to do a scenic, strenuous hike for training or for pleasure. 11.25 miles after, we were home bound. Note to self: Take a windbreaker that is waterproof when you are going to summit! Pingback: Cactus to Clouds - Palm Springs to Mt. San Jacinto - Beyond Limits on Foot! Pingback: 10,000 Feet Peaks in Southern California - Beyond Limits on Foot! Pingback: Mt. Baldy, Dawson Peak and Pine Mountain via Backbone Trail: Angeles National Forest - Beyond Limits on Foot!